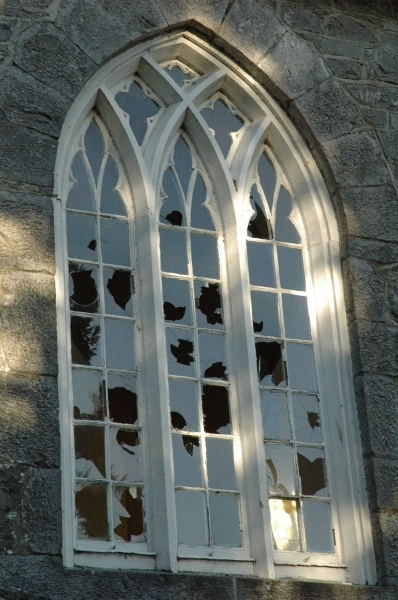 THE congregation of St Catherine's Church have been overwhelmed by the generosity and support of the people of the area following last week's act of vandalism which saw over 100 panes of glass smashed at the 200 year old church. ''We have been getting tremendous local support,” Rev. Isaac Delamere, Rector of St Catherine's Church, told the “Tribune”. “People have been calling and leaving in donations. There have been offers of assistance in cleaning the church, companies offering to help with repairs. There have been offers from local companies to assist with fundraising,'' he said. The local Church of Ireland Rector expressed his thanks to the wider community.
'' I said we're not for throwing stones back, we have seen the damage stones can do. We have no desire to further marginalise people. This act is not reflective of Tullamore, this is a tremendous community,'' he commented. Rev. Delamere said the insurance will go a long way towards covering the cost of restoring the windows, however, tens of thousands of euro will be required to install security cameras and to place wire meshing or some form of additional glazing on the glass. ''We will put timber boarding up in the meantime. It will probably be the end of January by the time the windows are repaired. A lot of the glass is original,'' said Rev. Delamere. Parish Secretary, Trudi Colton, believes the incident may have happened while members of the management committee were holding a meeting in the Charleville Centre. Ms Colton said there were 116 panes of glass broken on 8 windows. Church services will take place in the Charleville Centre for the next number of weeks. An Ecumenical service which was due to take place in St Catherine's Church has been moved to the Methodist church on High Street. Local Fine Gael councillor, Tommy McKeigue, said he hopes the community will get involved in helping with fundraising. ''I hope the wider community will put their shoulders to the wheel. People don't like when that happens in a community,'' he said. Meanwhile Gardai are still seeking information and are appealing for witnesses who may have seen anything suspicious to contact them. A Garda spokesperson said they may be able to get some information from the stones regarding DNA and where they came from. Tullamore gardai can be contacted at 0579327600.